If you like fried food a lot then it would be helpful to fry them in an oil that gives you the maximum benefits. One such edible oil that people are using for centuries to make their food tasty and healthy is the mustard oil. This tangy smelling oil is used in India for centuries and recent scientific studies into its amazing health benefit have made its pre-eminent position in the kitchen a foregone conclusion. Here we will try to give you some examples of fantastic benefit this amazing oil provides to your body when you take it regularly. If you are a regular user of this fantastic oil, then you should make it a point to use only the best mustard oil for cooking so that you get the maximum benefit from it. 1). If you are a regular user of mustard oil, then this edible oil in your diet works overtime to protect your body from many diseases. Research on the mustard oil has shown that this amazing oil has the capability of fighting cancer. This amazing property of the mustard oil is derived from the presence of linolenic acid. This acid gets converted into the Omega 3 fatty acids that are believed to fight stomach and colon cancer in an individual. 2). Mustard oil also works overtime to keep your heart healthy and functioning at optimum level. 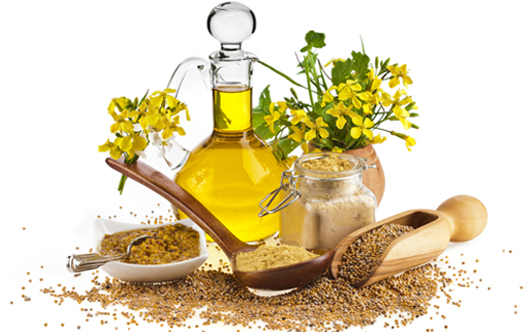 Mustard oil has a high concentration of monounsaturated and polyunsaturated fatty acids. These two wonder element for your body along with omega 3 and 6 fatty acids helps to keep the heart healthy. Regular intake of mustard oil reduces the LDL (low-density cholesterol is also known as bad cholesterol) and increase the HDL (high-density cholesterol or good cholesterol) in the body. This has a very positive impact on the health of your heart. 3). Mustard oil is also used to decongest the nose in case of a severe cold. The pungent smell of this oil helps to clear the nasal tract and allow you to breathe properly. Additionally, mustard oil and caraway seeds when boiled together in water generate a steam which when inhaled clears the respiratory tract from any phlegm buildup. This quick treatment is without any side effects and gives an individual temporary relief from the congested nose. 4). When you use the best mustard oil for cooking that does not have any impurities or is not blended with other edible oil, then it can play an important role in stimulating your appetite. Mustard oil can increase the production of bile juices from your liver and spleen and also improves the secretion of digestive juices in the stomach. This plays an important role in increasing your appetite significantly. 5). Mustard oil not only works wonders from inside your body but also helps protect your skin from fungal and bacterial infections. The anti-bacterial and fungal property of the mustard oil makes it a very good massage oil for your skin. In addition, mustard oil also shows anti-inflammatory properties which help to keep swelling and pain under control. 6). If you daily massage your scalp with mustard oil, then it will help in keeping your hair healthy. The natural properties of mustard oil prevent premature greying of the hair and the regular massage of the scalp with this oil prevents dandruff formation and also strengthen the hair roots. All these amazing properties of the mustard oil has made it a very important oil that should be used regularly in our diet. However, make sure that you are using only the best mustard oil for cooking to get the optimum benefit from this wonder oil that provides an individual with an all-around protection to his body both internal and external.